You are to write on monotone the rhythm of the following repetitive drum pattern. You are require to add time signature and bar lines and also group the notes. The rhythm pattern will be played four times. Rhythm of a melody in simple time. You are the write the rhythm of the following melody on monotone, adding the time signature. It begins on the ﬁrst beat of the bar. 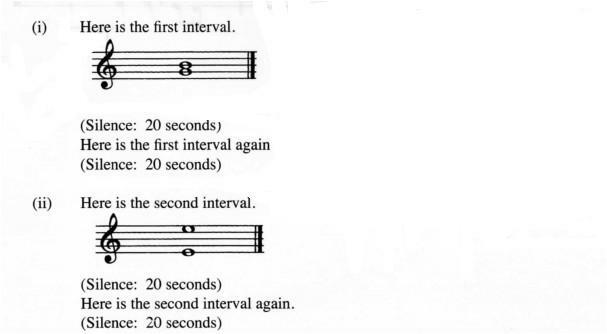 Test 1 (b): The melody will be played four times. 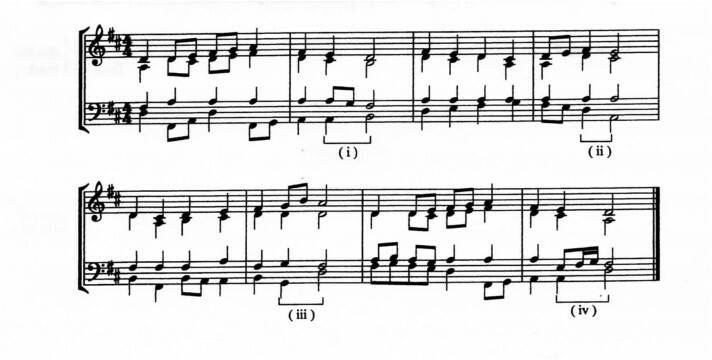 Test l (c): Rhythm of a melody in compound time. You are to write the rhythm of the following melody on monotone. It begins on the last beat of the bar. The melody will be played four times. You are to write the following melody in the key of A major. The melody will be played through once, then the ﬁrst phrase will be played twice and the second phrase twice. Finally the whole melody will be played right through once again. Write the treble clef and the key signature of A major now. The melody is in time. Write the time signature now. The melody begins on the ﬁrst beat of the bar. Here is the crotchet pulse. Here is the tonic chord of A major and the key note followed by the whole melody. Now, here is the keynote and the second phrase. Finally, here is the tonic chord followed by the whole melody. You are to write the following melody in the key of B minor. 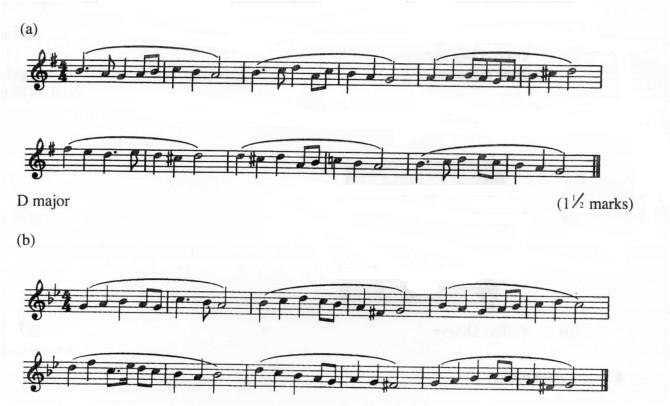 The melody will be played through once, then the ﬁrst phrase will be played twice and the second phrase twice. Finally the whole melody will be played right through once again. Write the treble clef and the key signature of B minor. The melody is in 8 time. Write the time signature now. The melody begins on the last beat of the bar. Here is the dotted crotchet pulse. Here is the tonic chord of B major and the key note followed by the whole melody. Now. here is the keynote and the second phrase. Two intervals will be sounded harmonically. Each interval will be sounded twice. You are to describe each of the intervals. Test 5 (a) The following melody is in the key of G Major. It modulates once away from the tonic key. You are required to name the key to which the melody modulates before returning to the tonic. The melody will be played three times. Here is the tonic chord of G Major followed by the ﬁrst play through. Test 5 (b) The following melody is in the key of G Minor. The melody modulates once away from the tonic key. You are required to name the key to which the melody modulates before retuming to the tonic. The melody will be played three times. Here is the tonic chord of G Minor followed by the ﬁrst play through. You now have three minutes in which to check your answers before handing in your paper. Answer questions from all sections. This performance consists of an introduction and four sections. (c) The concertmaster is an important member of the orchestra. Award full marks (4) for correct rhythm without bar lines For wrong time signature, penalize time signature and bar lines then treat rhythm (note values) as bars and award. (a) Melody in a major key. Deduct ½ mark per bar for wrong not values. 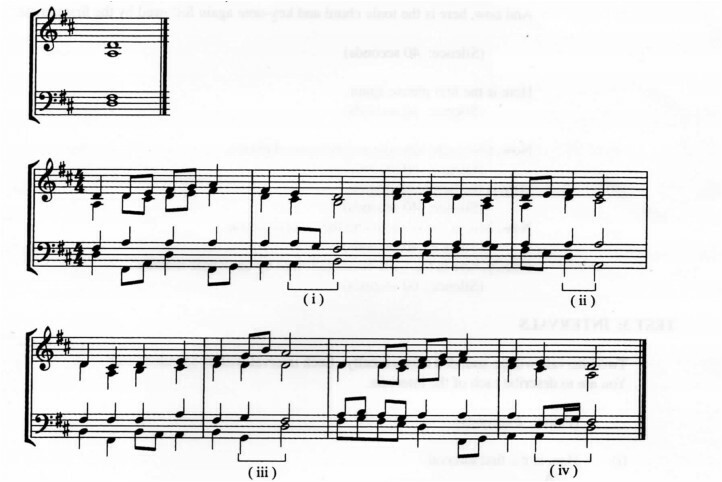 (b) Melody in a minor key. (b) Music encourages the initiates to be brave. Music psychs the candidates to face the initiation bravely. The songs educate the initiates on the importance of circumcision. Songs are used in educating the initiates on adult life. Entertaining the initiates, their parents and those in attendance. (iv) William Ingosi - Ishiriri. l mark for each correct instrument. Melody in the highest voice. Same music repeated for each verse/stanza/strophic. Syllables fa-la-la used as refrain. Written in dance like metre. (iii) - Father was the leading violinist of St. Mark’s Chapel. - He received education in music. - He received education in priesthood. - Extensive travels, composing and conducting operas throughout Italy and Europe. - Violin lessons in orchestra at St. Mark’s Cathedral. (iv) - Giving piano lessons. - performance as a pianist. (iv) - Tone colours tends to be dry and clear. - Large ochestral works are programme. Teso folksong - From Ngoma za Kenya. PPMC Recording. - Solo by female and chorus from mixed female voices. - Chorus repeats solo with variation. - Supporting the chorus response through rhythmic variations. (a) (i) Sonata - Allegro forrn/Sonata form/First-Movement form. -The strings of a harp are connected to the arched arm while those of a lyre are connected to the crossbar. - The strings of the harp run at an angle to the resonator whereas the lyre‘s strings run horizontal/parallel to the resonator. - Tuning of the instruments before the concert and rehearsals. - Controls the performances during rehearsals/practice. - Co-ordinates with/consults conductor regarding extent of practice/rehearsals of the orchestra. - Plays the solo if written for his/her instrument. - Leader of the violin section/1*‘ violin. - Consults with the conductor. - Technical manager in the orchestra.